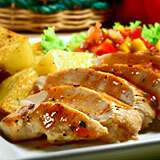 "Tender Moistened Cowboy Grilled Chicken Breasts"
Seems it has been a tradition to have some recipe on our emails. Here’s another! “Cowboy Tender Chicken?” Pretty easy. Have you had a problem with grilled chicken breasts becoming dry? We had a restaurateur tell us one of their secrets. They first skin the chicken, then boil it till really almost done. Just to the point before it falls apart. This water is salted and peppered to taste as the chicken is boiled. Once taken out of the water, it is placed in a glass baking sheet type of dish, then marinated according to desire. Italian dressing can be used, or a mustard based BBQ sauce, or even a chili based tomato sauce. Once soaked for a cooling off time in your marinade, you can then place on your grill rack and, using lower heat settings, baste the chicken in the same marinade. For those who like strong BBQ, now is the time to add those habaneras, jalapenos, or brown spicy mustards. Garlic, or other herbs can be placed on the meat as it finishes basking in the smoke of your drippings against charcoal, or gas. If you want, add a few wood chips to your heat. Some like mesquite, some apple or pear. Play with your choices. Take an old ketchup squeeze bottle, (never throw away good junk), fill it with a good cover sauce to complement your flavors, thus far, and drizzle some color onto your finished delicacy. Add garnish. Add some steamed veggies and other fresh kinda sides too. The key to grilled chicken breast that melts in your mouth is precooking in the brine. Guess What? We have a set of Moss Brother's Cowboy Grilling Instruments coming available next week. Come again for the details. How to Place your Orders with us or, Buy it Now "